The S.C. Department of Natural Resources will continue efforts to remove and eliminate feral hogs from North Island in Georgetown County by scheduling three hog hunts with dogs. “Feral hogs have continued to multiply on the island, causing destruction to the landscape and native plants, jeopardizing the nesting success of ground-nesting birds and sea turtle nests scattered along the beaches of this barrier island,” said Jamie Dozier, wildlife biologist with the S.C. Department of Natural Resources (DNR). These hunts are part of an overall hog removal project on the Yawkey Wildlife Center. In order to help remove the destructive feral hogs, DNR will allow three hog hunts with dogs to take place on North Island only. The three day hunt periods (Thursday-Saturday) are scheduled for February 13-15, 20-22, and February 27-March 1 from sunrise to sunset only. North Island is only accessible after crossing Winyah Bay by boat and contains 1,410 acres of uplands and 1,703 acres of marsh. •	No more than four bay or catch dogs per party. •	No still or stalk hunting is allowed. •	One shotgun permitted per party (buckshot only), and sidearms will also be permitted. •	Hog hunters must have in their possession a valid South Carolina hunting license. •	All hunters are required to wear a hat, coat, or vest of solid international orange while hunting. 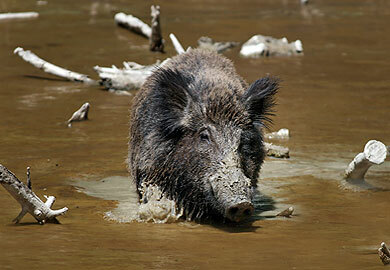 •	Hogs may not be removed from North Island alive. DNR staff will periodically be on site to collect pertinent information. For more information contact the Yawkey Wildlife Center at (843) 546-6814.